These hardwood Skiddles are beautifully polished to give a quality finish. Test your accuracy to the limit and try to knock all the pins down in one. 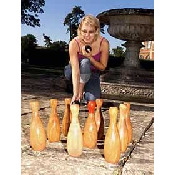 The set contains 9 skiddles, 3 regulation balls, instructions and full rules. Let the competition begin.